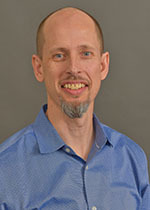 Dr. Maarten Vonhof is a professor in the Department of Biological Sciences at Western Michigan University, and is currently the Director of the Institute of the Environment and Sustainability. Vonhof is an ecologist and evolutionary biologist with strong emphasis on conservation. His main research focus is on understanding how organisms respond to environmental change. Within this broad framework he pursues studies in three broad areas: The influence of land use change (particularly urbanization) on the ecology and behavior of birds and their symbionts The ecology and genetics of host-parasite and host-disease systems Comparative population genetic structure and phylogeography Vonhof's research combines field studies on animal behavior and ecology with laboratory approaches using molecular markers such as microsatellites and DNA sequences.